Earn $8.07 in VIP credit (807 points)What's This? Replacement freehub body for Easton wheels. Easton's high-end wheels come standard with a Shimano 10-speed ONLY R4SL freehub body. Compatible with EC90 Aero, EC90 TT, EC90 SLX, EA90 SLX, EA90 SL, EA90 TT, and EA90 Aero wheelsets. 85 grams (Shimano/SRAM 8/9/10 Compatible). The SL version features a ceramic bearing and eliminates excess splines and other material to save up to 22 grams. If you're upgrading from Shimano 10 speed to 11 speed this replacement hub will allow you to continue to use your Easton wheels. It's easy to swap hubs and the new 11 speed cassette works perfectly. I recommend this too anyone who is looking for quality performance! Needed to replace the stock freehub body to mount a SRAM cassette. This did the job and was fairly easy to install (Need a 19 mm cone wrench to do it). This was great for me and wasnt expensive!!! Purchased the freehub for my 2011 Campagnolo Chorus group. With Easton you come to expect quality and this freehub body for Campagnolo 11 speed is no exception. The Campagnolo cassette fit perfectly onto the freehub body and due to the width of the 11 speed cassette there no need for a spacer. The fit into the R4 hub is a perfect and is the same as the 10 speed Sramshimano, which makes it easy to change between the 2 systems. Right of the box the ball bearings are running freely and keep in mind they are standard ball bearings, non ceramic, however they are a great value at almost half the price of ceramic bearing version. I can only recommend this freehub body. The Easton R4 Freehub body works great. The problem is that the Easton EA90 wheels with the R4 hub are dished in such a way that I was unable to run them with the Campy 11 group. To get the rear stops set properly so that the chain would not jump down a cog the cage was too close to the spokes. I ended up selling the wheels. I changed my groupset from Shimano to SRAM so I needed a compatible freehub body for my Easton wheels. Website provided great guidance and information. Als, great prices and fast shipping. Thank you Bike Tires Direct.com. Easy install for my ec90tt wheelset couple of turns of the wrench and pow the Sram Free Body was off and I was ready to pop on the Campy free hub. Not too loud and quite light. I am super impressed, great overall product. I was never happy with the hybrid dual purpose use of the original freehub. Shimano and Sram measure peaks and valleys of the cassette differently. Although both Shimano and Sram cassettes fit the stock freehub, there was a lot of slop and the freehub body tends to get chewed up. Search forums and you will find several threads of complaints. 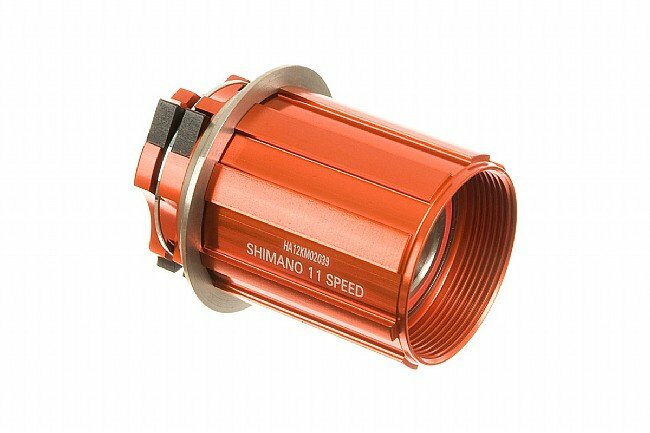 The Easton HA10E0906 red freehub is Shimano 10 speed specific and eliminated the slop. Cheap price to pay for correct and precise fit.